Rajasthan Budget 2017-18, Highlights, Full in PDF: Rajasthan’s Chief Minister Vasundhara Raje on 8th March 2017 presented Rajasthan state budget 2017-18. Raje is presenting 4th Budget on the International Women’s Day, which also happens to be her birthday. 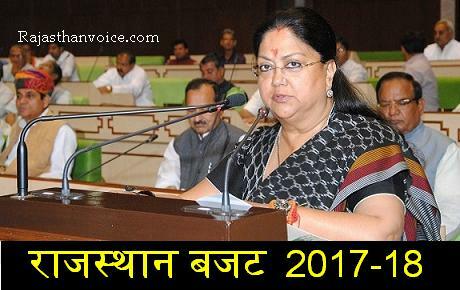 Here is Key Rajasthan Budget 2017-18, Highlights, Full in PDF for various competitive examinations of Rajasthan state government. Rs. 500 crore for public utility works for citizens of mines affected areas. Renewal and Strengthening of 5000 kms. rural road at the cost of Rs. 800 crore in RIDF-23. 15 projects for development of the 796 kms. state highway at cost of Rs. 580 crore. 26 roads worth Rs. 242 crore in 220 kms. to be made in 13 districts with mining relevance. Rs. 8647.21 crore provision for PHED which is 15.68% more than RE 2016-17. Rs. 156.83 crore for art, culture and archaeology department which is 49.42% more than RE 2016-17. Rs. 10.90 crore for conservation of wood fossils, display and development of infra facilities for tourism at Aakal Wood Fossil Park. Rs. 29.69 crore for computers and internet. Rs.7.10 crore for Infra facilities to 8 Engineering College running under Society Act . Rs. 146.19 Cr. for providing machinery and equipment’s in 69 ITI’s. Rs. 125 crore for various revenue related construction activity. Rs. 8.33 crore for replacement of old vehicles. Rs. 16.62 crore for basic facilities in various jails.